Ok, so now you know my pick for the Superbowl, too. Hot Rod keeps telling me it is going to be hard to know how to cheer for because he likes both teams. I tend to agree, but I might jsut root for the Steelers. Is he just a cutie patootey or what? A big, rugged cutie. Getting puppy kisses. Oh, the cavity factor is increasing here. Oohhhh, with a little bit of danger and bad boy mixed in. I'm in love. ooh, my loins are burning, too. Go Steelers! Big Ben. Hmm, *scratching chin* I wonder how he got THAT name? OHHHHHHHHHHHHHH, the bad boy pic! YUM! Ahh, the eternal paradox. Ladies SAY they want someone sensitive to their needs, kind and considerate, etc., but in reality, you get hot and bothered by the "Born To Be Wild" types . . .
Anon: Seeing a man look that hot in leather and then going to pieces over a puppy is the ultimate. kinds of hairy are decidely ungood. Have no doubt, root for the Steelers. They're my team since I was 5 but beyond that - when in doubt - go for the cold weather team from a blue-collar town - that's football, to me. Usually, avoid dome teams though - which would rule out Minnesota. But, it's okay when there's a personal connection. In any case, I'm getting nervous already. P.S. The hairy guy talk is weirding me out. 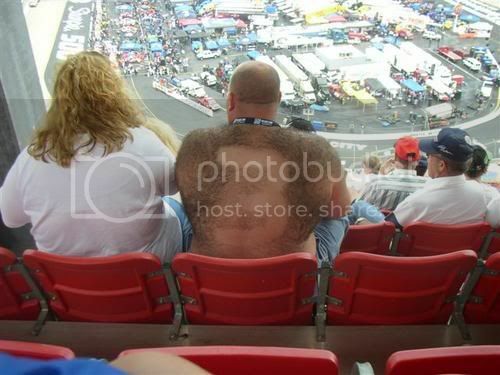 Something about a hairy man that scares me.